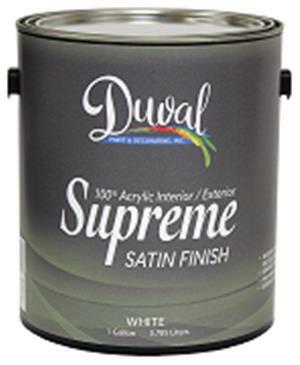 Supreme 100% Acrylic Int/Ext Satin Finish- Duval Paint & Decorating, Inc.
Duval Paint's Supreme 100% Acrylic Int/Ext Satin Finish is formulated to provide superior durability, and excellent weathering properties. It resists fading, provides excellent coverage and is mildew and alkali resistan. Its advanced acrylic technology formulation provides excellent adhesion, superior durability, fade resistance, fade resistance, and allows for application in residential, commerical, architectural and light industrial areas, as well as areas of varying climates.It surpasses all EPA Standards pertaining to VOC requirements and meets, equals, or exceeds Federal Specification TT-P-19 for quality and performance. Mildew Resistant - This paint contains agents that hibit the growth of mildew on the surface of this paint film. Estimated Coverage: Cover approximately 300-400 square feet per gallon. FOR INTERIOR AND EXTERIOR USES!